Tax avoidance is working around the rules of the tax system in order to pay less tax than Parliament ever intended – so operating within the letter, but not the spirit of the law. Tax avoiders often enter complicated, artificial ‘schemes’ that have no real financial purpose, other than to avoid tax. You may have heard about high-profile users of these sorts of scheme in the news. Some of these schemes are sold to potential users by a promoter – that’s why we can say that they are ‘marketed’. This next set of questions focuses on this type of marketed tax avoidance by individuals rather than businesses. It is apparent that even the apologists - and there aren't many of them - have difficulty making up excuses. The tax profession should take note. Didn’t you tell the Select Committee that there were no university courses in Tax in this country? How can there be tax academics? This and many other surveys on important financial or constitutional issues continue to show out of touch our “representative” political system is with the views of the voting public. If nothing else, it shows how unrepresentative our politics and the machinery of the state has become. In the world where technology is being allowed and encouraged to change almost everything – it should be allowed to replace political representation with a far greater amount of direct democracy on key issues affecting the population as a whole. While there are obvious dangers with majority rule as the only basis of government, the views of the majority should be much more greatly obtained, considered and applied where appropriate by any government who claims to be legitimate. Where a government chooses to ignore the views of the majority they should be forced to explain themselves, for example where they are protecting the poor, weak and powerless minorities which I am sure most normal human being will accept as legitimate use of representative power. The once in 4 or 5 year chance to have your political say, should be sent into the pre-information technology past where it rightly belongs. This survey was undertaken in July 2015. 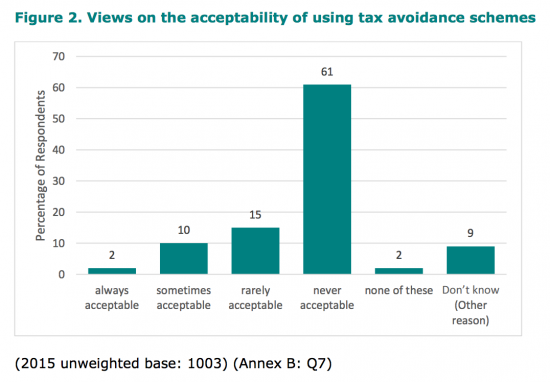 Given subsequent events with Google et al, I imagine the percentage of people saying it is never acceptable to indulge in tax avoidance would be much higher. 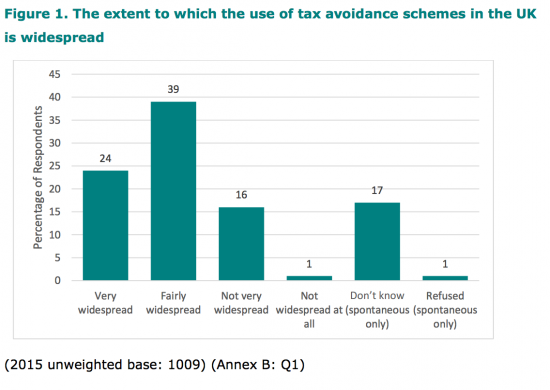 It’s a rather encouraging response from the public, and gives the lie to much of the right wing propaganda, that somehow tax avoidance is OK, because of the legal loopholes that allow it. It’s the government’s fault again! Well, yes partly, and HMRC should work to change the law. But it’s also a moral issue, and clearly people disapprove strongly in principle. I think saying that people “strongly disagree” is a little too abstract. By that I mean they will strongly disapprove when the question is applied to a faceless corporation or ‘the rich’, but if it was applied to themselves. For example, refusing in principle to pay a handyman in cash, not moving assets between a married couple for tax reasons, etc. I may be a cynic but people are very pious when it’s not their money. As I’ve said, or at least intimated, before, Richard, the “amongst other people” syndrome has to be, at least partly, because, when the “little” people see the Googles of this world getting away with it on a mega-scale, they surely feel little motivation to change their own ways, particularly when HMRC so aggressively focus their collection efforts on the “little” people. This, I suspect, is a side-effect about which this government cares not a jot because they know that the “little” people are the softest target. I believe that this might be a narrative that could be developed to their benefit by Labour. Nick makes a good point below. “Tax morale” is an important element in a ‘voluntary’ system like the UK; HMRC are compounding the damage to that by doing things like misusing law to penalise farmers ( http://www.accountingweb.co.uk/article/hmrc-puts-pressure-farmers/596922 ) while apparently going soft on big business – each individual small taxpayer is a soft target – but statistically, most of them will get away with it, and they’ll feel justified in doing so. I’m horribly afraid of ending up in a bizarre and counterintuitive world where net tax take drops (because big business is able to manage liabilities down, and small taxpayers work to mimic that outcome) while the few SME/Micro cases that *do* get picked up are presented as abuses of administrative power, destroying tax morale still further. Richard – on rereading, my last submission makes it look as though I’m describing the targetted farmers mentioned in the AWeb article as “getting away with it” – which is the opposite of what I meant; seeing injustices like that is what’ll make a cash in hand evader think they’re ‘justified’, and *they’re* the ones who’d be getting away with it. Tax exists to serve society, not the other way around, and destroying elements of society like hereditary family farms is a perversion of the system. Richard, I was wondering if anyone has reported problems with their posts disappearing since yesterday. I’ve had this problem since re-starting my PC yesterday afternoon and whereas my submissions previously showed as awaiting moderation until approved, they now just disappear off into the ether? Not sure if this is a browser issue, I use Firefox not the dreaded Google, so have changed some of the privacy settings to see if this makes any difference. If this post disappears as well I will try emailing you instead. I avoid alcohol taxes by not drinking. I avoid tobbaco taxes by not smoking. I avoid airport taxes by not flying. I avoid a lot of petrol taxes by not driving a lot. I avoid all income tax by not being paid much. Am I going to be forced to take up smoking, drinking, flying and long-distance driving just force me to stop avoiding those taxes? When is the single person’s tax allowance going to be abolished to prevent me from avoiding paying income tax? jgh is of course wrong, as the above definition shows. 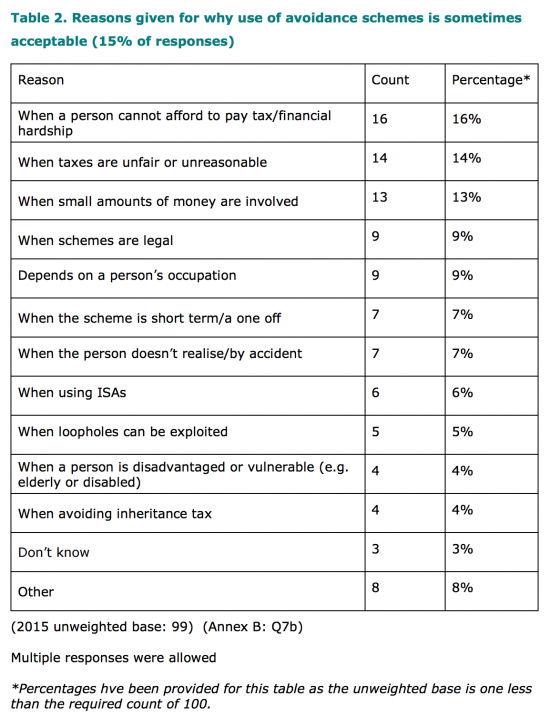 Of course there are a wide range of tax avoidance activities and the HMRC survey deals with only one. sort of thing you hear spouted at the IoD after a good dinner. You can also cheekily avoid the 5p bag charge by not buying a plastic bag. What difference does it make to legal activity whether the majority approve or disapprove? I’d imagine most people think consenting adults having an extramarital affair is unacceptable. The state cannot touch a hair on the heads of those who engage in it. Indeed, the state has a duty to protect them from harm from those who disapprove, even if the majority. You really do not understand what a general anti-avoidance principle properly enacted could do, do you? Yes, and I have lived in such a country. Has had such a principle in its legislation since the mid 1980s. 1) the ATO doesn’t like litigating it, so there is a lot of horse trading with the big corporations with the stomach and the resources for a fight. Deals like the Google one here in the UK are commonplace and un-newsworthy. Tax becomes negotiable at the big end of town. 2) given the horse trading, there are lots of defections from the ATO into the big accounting and law firms at senior levels. Not hard to see the value of their contacts and understanding of how the system works. Your blog title is entirely misleading. 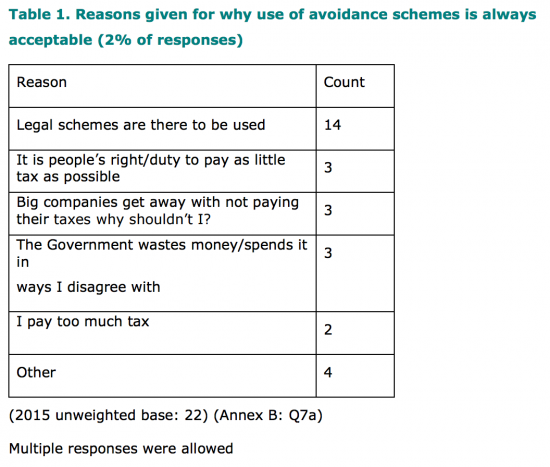 The survey makes clear that it is the use of marketed artificial tax avoidance schemes that people find unacceptable. That is clear from the HMRC extract. I would have voted the same way. That is a far cry from tax avoidance in general. For example, by choosing to operate as an LLP rather then through a company and paying salary, you are avoiding employers’ NIC. A tidy saving. This would clearly fall within avoidance planning as any professional in the industry would acknowledge. Hoe can trading through a medium provided by law which results in exactly the same sum due as would be payable in partnership, which would be the alternative, ever constitute avoidance? If you’re going to pick a silly argument at least make it one that has an iota of substance to it. Exactly the same sum is due? Richard, I mentioned a company and an LLP. They both provide the same limited liability in law. Some professions cannot be companies (Lawyers and accountants for example) but bloggers and authors can choose to operate as a company or an LLP. You need only one director/shareholder so there is no need to co-opt someone who does nothing into the business. Into the Members pocket goes £48,821. Over £5k which would have gone to the government is saved. Of course you do need another person involved to actually form an LLP. Even if that person does next to nothing and it’s a little….well some might say artificial. Of course it’s all legal and good tax planning. Or is it avoidance? The boundaries are so grey these days. Multinational companies have the choice under the current law where they locate HQs and where they place IP. That’s their right. Just take the Dianne Abbot line. At least that is honest. So which of Google’s, Amazon’s, Starbucks, Microsoft et al’s structures are NOT specifically allowed by law? Does she take part in management decision making? Does she discuss a great deal of what I do before it happens? Surely “use of ISAs” is both within the letter and spirit of the law, so offering it up as a “marketed” avoidance scheme seems a little incongruous? If I transfer half of some shares I own to my wife the day before we sell them so we can both use our annual CGT exemption the law allows that. Quite clearly the writers of that law must have envisaged such a scenario. They are not stupid. So you would presumably accept that this is not tax avoidance either? I think he is making reference to an ISA because it is mentioned in Table 2 as a reason why tax avoidance is sometimes acceptable. To be honest it tends to suggest that even when presented with a quite detailed definition of tax avoidance some of the people answering the questions hadn’t a clue what they were being asked. It’s a stupid survey, really. Firstly, many of the sort of people who strongly agree that it’s wrong, no doubt have their own hypocritical practices. For others, it’s “wrong” because they can’t do it, or are jealous. The point is that it’s easy to be high and mighty when it doesn’t affect you and this is a blindingly dumbed-down survey. Ask a slightly different question and you’ll get a different answer. So I am able to flatly contradict, with proof, your claim that choice of LLP was because that was the only format you were comfortable with and you are too much of a coward to print it. What a pathetic person you are. Courageous state? moral hypocrite. Richard. Nobody is interested in made up facts, but most people are interested in debate. I’ve seen you threaten at least three posters with bans in the last few days because you disagree with them. I refrain from posting in the main by now but as an observer you risk turning your blog into an echo chamber which would have little value.